0 (or reduce) sugar-sweetened beverages. 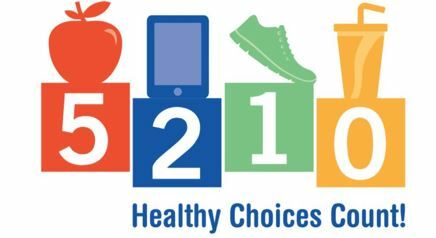 “This is the first statewide effort to provide consistent messaging and programming regarding the subject of childhood obesity,” said Governor Reynolds. According to IDPH Director Gerd Clabaugh, the program focuses on using consistent messaging across all sectors, including childcare, healthcare, out-of-school, schools and work places. “If families are exposed to consistent messaging in many places, they are more likely to adopt and maintain healthy behaviors in their daily lives,” said Clabaugh. In November and December 2017, a statewide 5210 campaign will include toolkits, social media, advertising, website content and community commitments. IDPH is partnering with the Iowa Association of Councils of Governments (ICOG) and its affiliate council of governments to work directly within the communities of Malvern (Mills County), Dubuque (Dubuque County), Mt. Pleasant (Henry County) and West Union (Fayette County) to implement community wide strategies around 5-2-1-0. Each community is receiving grant funding to improve access to a healthy environment. In the Des Moines metro area, United Way of Central Iowa will work with local healthcare providers and will continue its work with Visiting Nurse Services to improve childcare, out-of-school and school environments. The state of Maine developed the 5-2-1-0 campaign with the goal to increase physical activity and healthy eating for children from birth to 18 years through three core principles: healthy places support healthy choices, consistent messaging across sectors is essential, and strategies are based on science and recommended by the medical community. This entry was posted in Active Living, North Fayette Valley CSD by Northeast Iowa Safe Routes to School. Bookmark the permalink.